Having an acne prone skin makes ones self confidence go down.......but one can always recover from an acne prone skin the answer lies in regular usage of this amazing product which i am reviewing below. 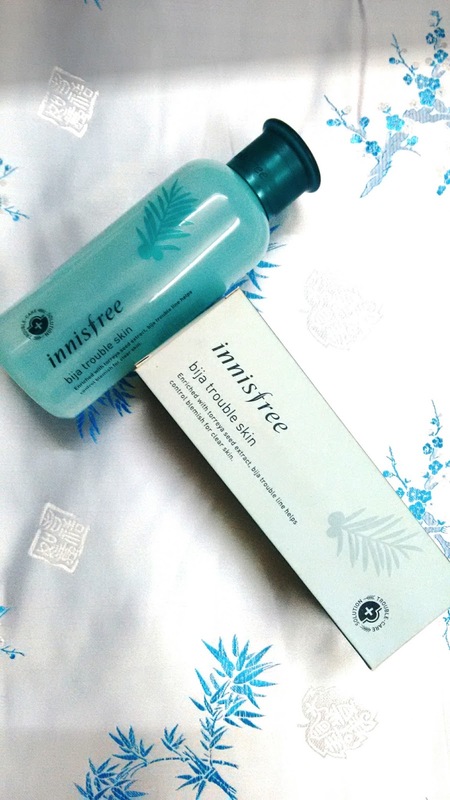 This is a Korean brand Innisfree which believes in using natural ingredients in their products. The Bija trouble skincare toner has the following ingredients namely naturally derived salicylic acid, naturally derived alcohol, which removes the impurities from the skin pores and exfoliates the skin to give a clear complexion. it compromises of torreya seeds, the trees are found grown in Korea. Also present are natural essential oil which soothes the skin. It got a mild dewy refreshing fragrance. The best part is that this product does not contain any of the harmful chemicals like- parabens, synthetic colourants, mineral oils, animal derived ingredients, imidazolidinyl urea which causes many harmful skin allergies. This is an amazing product recommended to me by my Friends. As i have an acne prone skin i started using this product. How to apply this on the skin ? The following steps will help you in daily application of this product. First: use a mild cleaner on the skin and pat your face dry with clean face towel. It needs to be applied after using mild cleanser. The cleanser i am using is Cetaphil mild cleanser followed by the amazing toner : Bija Trouble Skin. Second: Take sufficient amount of toner on a cotton pad and gently pat the toner on the skin. Important tip- if you have acne on the specific area on the face then one should take separate cotton pad with Bija Trouble skin toner for that area. And use the other cotton pad with toner for the other area on the face. This will prevent the acne infection from spreading all over the face. Third: Make sure that the toner is well absorbed by the skin. Apply mild moisturizer on the skin. p.s - Always use cleanser ,toner, moisturizer skin routine for healthy glowing skin.